From 1200#-8000# Vertical Lifts, Beach King builds what you need. Here, in Minnesota, how we do what we do matters; we do it right or we make it right. That work ethic is why we manufacture our dock and lift systems in Detroit Lakes. It’s also the reason folks around here choose Beach King. Quality, price, performance, and a 15-year warranty (right down to the pulleys) set us apart from the rest. Beach King lifts are welded solid, producing a product that remains structurally sound over time. We weld extra gussets into every corner to keep our lifts true, allowing the customer to hook up and pull the docks without bending them. We offer screw adjustable legs; all Beach King lifts are designed to be adjusted above water, eliminating the danger of swimming to the lake bottom or having to support the lift in the air make height changes. Safety and quality are paramount to us. We manufacture vertical lifts in all sizes, including personal watercraft (PWC) lifts. 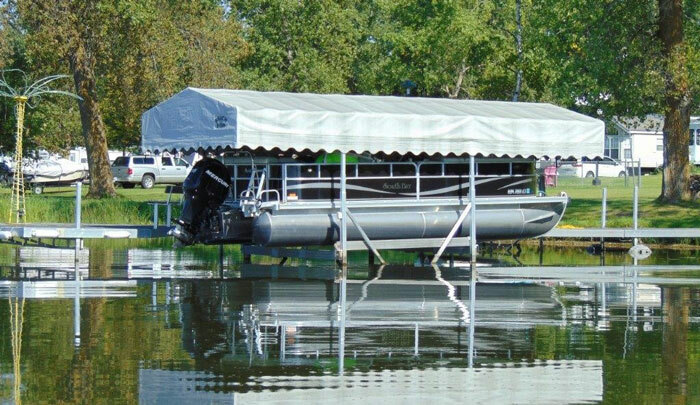 Beach King lifts have aluminum rails with soft plastic for your boat to rest on, and side bumpers for your Pontoon. All lifts come standard with full-length aluminum bunks featuring soft plastic coverings. From 8000#-6000# vertical lifts, we can build to suit your needs. Any lift can get your boat out of the water, but Beach King aims to make the job safe and easy, using only the strongest pulleys and chain-driven winches. Because galvanized steel is prone to rust, we rely on stainless steel cable, shown to last twice as long. Contact us for more information on Boat and Pontoon Lifts.